Following up on last month’s coffeemaker post, I was reviewing search results that brought people to my blog again and found a question I really didn’t answer. The search was about how to use a samovar to make tea. In my samovar post earlier this year, I talked about what samovars are, but not so much about how to actually use one. Let’s see if I can rectify that situation. 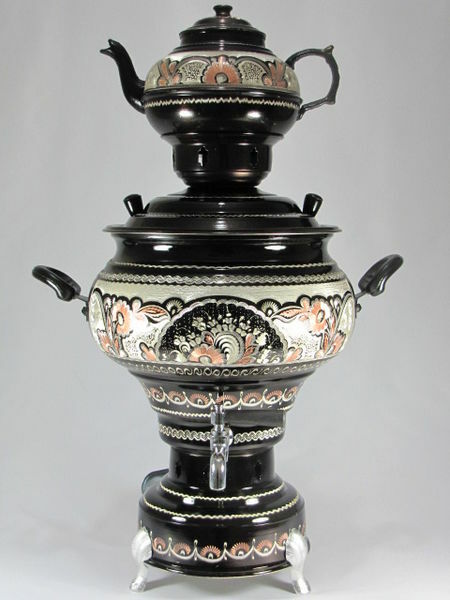 A traditional samovar has two parts: the water heating unit and a small teapot on top. Originally, the water was heated by coal or charcoal, with a chimney rising through the center. Nowadays, electric samovars are common — as much as you can call a samovar “common,” anyway. Either way, you can draw the hot water off from a spigot near the bottom. The spigot is visible, albeit not too clear, on the Turkish samovar pictured in this post. The samovar would sit in the center of the room (and would help to heat the room, in fact). The main compartment of the samovar contained only water. The little teapot on top was loaded with rich black tea and allowed to steep all day long. When anyone wanted a cup of tea, they would pour a bit of the strong tea from the pot and then fill the cup the rest of the way with hot water. After steeping that long, and being brewed so strong, the tea would be quite bitter. Depending on whether the samovar was being used by Russians, Turks, Georgians, or some other group, they might add anything from sugar to yak milk to the tea to cut the bitterness. Today, the main compartment of the samovar may be used to brew tea — or just to keep it hot after being brewed in another vessel. That way, you can serve the tea from the spigot at the bottom of the samovar. The pot, if present, is often simply ornamental. Posted on 16 October 2012, in Styles & Blends, Tea Thoughts and tagged preparing tea, samovar, search results. Bookmark the permalink. Leave a comment.